Disclaimer: Artwork used (with permission) for the button is Anglerfish by Vlad Gerasimov. This was another awesome reading challenge. I thought I'd enter again, see what new authors I discover this year. The Challenge is hosted by Jackie from Literary Escapism. 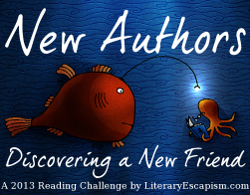 You can pick to do either 15, 25 or 50 new authors. It all depends on how fast you read and how adventurous you want to be. If you reach your goal halfway through the year, don’t stop. Any new author you try can be added to Mr. Linky. We all want to know about your new experience. Like last year, I'm going to try to read 25 new authors. If it happens that I read more, that's fine. For more details or to sign up, go to Jackie's post here. I'll post the books below, as I read them.